Indian Navy MR PFT Admit Card 2019 Is Released… The Indian Navy Stewards, Chefs, and Hygienists Hall Ticket 2019 is available on the Official website i.e., joinindiannavy.gov.in. Hence, the candidates can no more wait for the Indian Navy MR Hall Ticket 2019. Since the release date is mentioned by the Higher authorities of the Indian Navy. Also, you can get the details of the Indian Navy MR Selection Process 2019 by referring to this article and also the Indian Navy MR Exam Date 2019 which is Mentioned On Admit Card. So, candidates should keep this in mind and know all the details regarding the posts of Stewards, Chefs, and Hygienists. The Officials of the Indian Navy decided to conduct the Indian Navy Exam for 400 Stewards, Chefs, and Hygienists posts which will be Mentioned On Admit Card. Hence, the candidates should wait with much more patience. Moreover, the applicants should note down the Indian Navy MR Exam Date 2019 and prepare well for the Indian Navy Written Test and get qualified for the further rounds. Furthermore, refer to the below sections of the post to get more details of the Indian Navy Exam and the Indian Navy MR Selection Process 2019. As per the Recent Notice, the higher authorities of the Indian Navy explained the Selection Process along with the description. The Indian Navy MR Selection Process 2019 includes the Written Test, Physical Fitness Test (PFT), Medical Test, Document Verification. After the Written Test, the selected candidates should attend the PFT test. Moreover, for the candidate should perform for 1.6 Km Run in 07 Minutes, 20 squats (Uthak Baithak), 10 Push-ups. After the qualifying process, the candidate should attend for the Medical test. Also, for that, the candidate should have Good Physical and Mental Health. Moreover, Medical Test will be conducted by the Military Doctors as the norms of the Indian Army. A candidate is advised to validate all the details on their Indian Navy Steward Hall Ticket 2019. Candidates should bring the printout of their Indian Navy Steward Hall Ticket 2019 in the examination hall. Make sure that any Identity proof you carry to exam should have your latest photograph on it. Now, search for the Indian Navy MR Hall Ticket 2019 for the posts of Stewards, Chefs, and Hygienists on the Home page. Click on the link and you will see the Login page with some credentials. Now, fill all the required fields like Roll Number, Date of Birth etc. Submit the details once after the confirmation of correct details. Then, your Indian Navy MR Admit Card 2019 appears on the screen. Finally, download it and keep it safely for future purpose. Also, you can make a hard copy of it. 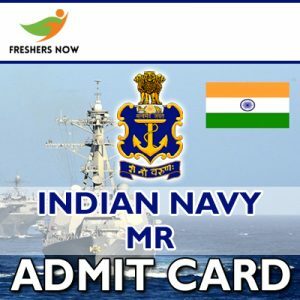 Got all the details of Indian Navy MR Admit Card 2019. Keep visiting Freshers Now for more latest updates. Thank you..! !